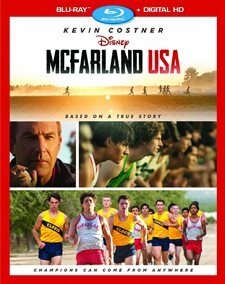 Based on the 1987 true story, McFarland, USA follows novice runners from McFarland, an economically challenged town in California?s farm-rich Central Valley, as they give their all to build a cross-country team under the direction of Coach Jim White (Kevin Costner), a newcomer to their predominantly Latino high school. Coach White and the McFarland students have a lot to learn about each other but when White starts to realize the boys? exceptional running ability, things begin to change. Soon something beyond their physical gifts becomes apparent?the power of family relationships, their unwavering commitment to one another and their incredible work ethic. With grit and determination, the unlikely band of runners eventually overcomes the odds to forge not only a championship cross-country team but an enduring legacy as well. Along the way, Coach White realizes that his family finally found a place to call home and both he and his team achieve their own kind of American dream. Download McFarland, USA in Digital HD from the iTunes store. McFarland, USA images are © Walt Disney Pictures. All Rights Reserved. If you've seen Lean On Me or Stand And Deliver, you've pretty much seen McFarland USA. Impoverished students succeeding against the odds; encouraged by their teacher to achieve greatness despite their surroundings. The difference here is merely the location – instead of inner-city ghettos, McFarland,USA takes place in the produce fields of California. Jim White (Kevin Costner; 3 Days To Kill) relocates to McFarland when he loses his coaching job in Mid-America. Besides a new job and home, Jim and his family must adjust to a whole new way of life in the Hispanic, migrant worker town. As Coach White observes his students, he comes to realize they could be molded into a top-notch boys Cross Country team. He manages to eventually enlist seven students and create a team that manages to win the state championship. 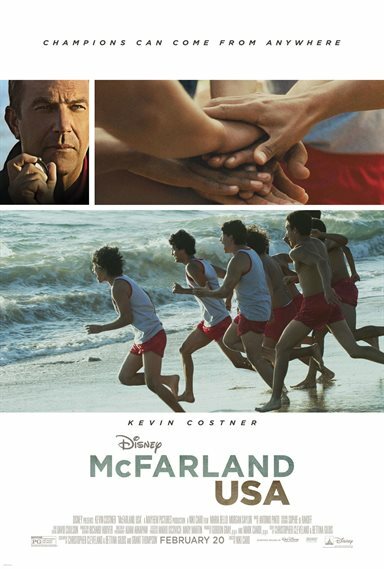 Based on the true story of the 1987 boys cross-country team, McFarland USA has an excellent cast headed by Costner. Ramiro Rodriguez, Carlos Pratts (The Bridge), Johnny Ortiz (American Crime), Hector Duran (Hide And Seek), Rafael Martinez (Marza), Sergio Avelar, and Michael Aguero make up the members of the team, who bond like family as they defy the odds, and become the best cross country team in the State of California. These individuals do a terrific job, especially considering that for some of them this is their first paid acting job. They complement Costner well and hold their own against the veteran actor. The story itself is a feel good, heart-wrenching tale of bright, talented young men who try to balance work, school and running while dealing with the pressure, in some cases, from their parents. To know that it is based on real people and events only enhances the story's appeal. Ultimately, to see most of the town rally behind them and support these young men is such a strong positive message that leaves you feeling warm all over. The 1080p video is what you would expect with vibrant colors and sharp quality. The lushness of the green fields truly pop off the screen at you. The DTS-HD Master Audio 5.1 adds to the dramatic appeal of the film and enhances the soundtrack for a complete overall experience. The extras are truly special on the Blu-ray. There is a music video that I enjoyed and the segments include a discussion with Costner and the real life members of the 1987 team. To see the people who inspired this story and listen to them talk about their experience is definitely worth your time. Unlike other Blu-rays, the deleted scenes are interesting enough to sit through once. While not a unique plot, the movie moves along at an adequate pace for the two hours and nine minute running time. The writers, director and cast keep the viewer engaged which helps to dissuade any lag time.